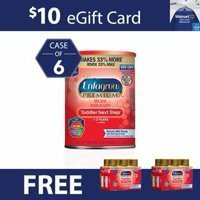 Walmart offers the FREE $10 Walmart eGift Card and 12 Ready-to-Use Bottles when you Purchase 6 Cans of Enfagrow Premium Toddler Next Step 32 oz Formula for $154.74. Back in stock. Available in select areas.